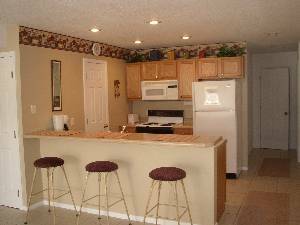 Come stay in our beautiful three bedroom, two bath WATERFRONT CONDO AT THE POPULAR LEDGES COMPLEX. We're located in the heart of Osage Beach, just three miles off Highway 54. By water, we're at the 20.5 mile marker on the breathtaking Lake Of The Ozarks. 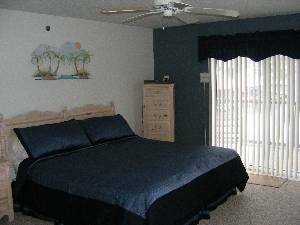 Our master bedroom has a king size bed, private bathroom, walk-in closet, ceiling fan, cable TV & 6' sliding door which goes out to the walkout deck. Our second bedroom has a queen size bed and cable TV. 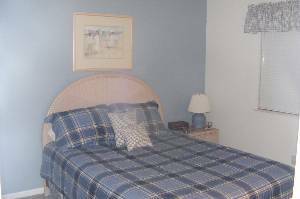 The third bedroom has two, twin size beds. 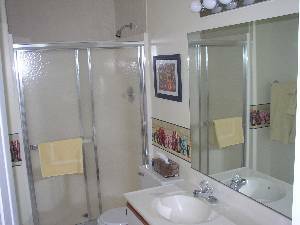 Both our bathrooms have wall mounted hair dryers and 100% cotton towels. There is a washer & dryer in the condo for your convenience. 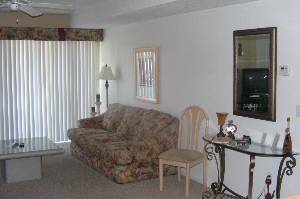 The living room has cable TV, VCR, DVD, stereo, high speed internet modem & ceiling fan. The dining area has seating for three at the counter and six at the table. The kitchen is fully stocked with everything you'll need for preparing meals inside & out on the deck. There is a gas grill on the walkout deck, seating and two ceiling fans. We have both 24' & 30' cove protected slips with electric which can be seen from the condo deck. The Ledges offers two pools. The lake area offers over 240 holes of golf, several courses within 5 miles. 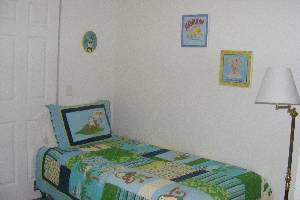 We are a SHORT car ride to Big Surf Water Park, Osage Outlet Mall, five screen cinema, Ozark State Park, antique stores, country sampler shops and boutiques. There are over 100 restaurants(many on or overlooking the lake) that will satisfy any taste. Deposit: $200 DAMAGE DEPOSIT REQUIRED ON ALL STAYS. DAMAGE DEPOSIT WILL BE REFUNDED WITHIN 10 DAYS OF DEPARTURE PENDING CLEANING/INSPECTION OF CONDO AND RETURN OF ALL KEYS AND PARKING PERMITS. $50/PER PERMIT FOR NON-RETURN OF PERMIT. Cancellations and Refunds: ABSOLUTELY NO PETS, PARTIES, SMOKING OR RENTALS TO ANYONE UNDER THE AGE OF 25 ALLOWED IN OUR CONDO AT ANY TIME--NO EXCEPTIONS, PLEASE DO NOT ASK. RESERVATION DEPOSIT DUE WITHIN 7 DAYS OF RESERVATION. FULL BALANCE DUE 21 DAYS PRIOR TO ARRIVAL. 10.475% STATE & LODGING TAX WILL BE ADDED TO ALL CONDO RATES. $25 FEE FOR NSF CHECKS. NO REFUNDS FOR LATE ARRIVALS, EARLY DEPARTURES, INCLEMENT WEATHER, OR MAINTENANCE ISSUES. QUIET HOURS 11PM-7AM STRICTLY ENFORCED. A COMPLETE LIST OF RULES IS LOCATED INSIDE THE CONDO. NON-COMPLIANCE OF RULES WILL RESULT IN FINES WHICH WILL BE DEDUCTED FROM YOUR DAMAGE DEPOSIT REFUND.